The 5GINFIRE project opens its experimental infrastructure tailored for testing of applications, services, and solutions from various industrial vertical sectors on the top of its 5G experimental infrastructure. 5GINFIRE is also looking for additional experimental infrastructures to join, thereby extending its facility. 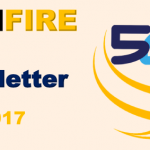 In order to open its experimental infrastructure for wide testing, the 5GINFIRE published a Competitive Open Call for experimentation with the submission deadline on 28 February 2018. All organizations eligible for participation in the EU Horizon 2020 program are invited to submit innovative proposals. A total funding of 375,000€ is available for experiments that will be evaluated through the Open Call process. In addition, 5GINFIRE is inviting proposals intending to extend the 5GINFIRE experimental infrastructure and services. For this purpose, further funding of 375,000€ has been reserved for successful proposals.